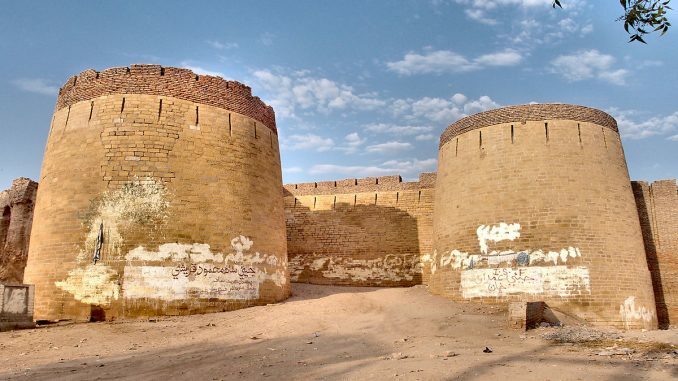 You won’t believe that there is still a region in Islamic Pakistan which is ruled by a Hindu king; ‘Rana Jagir’ is the name of that place which is near Amarkot. Amarkot is now rechristened as ‘Umarkot’. Probably it is a part of Islamization tendency. Today Rana Kunwar Hamir Singh, the 26 th descended of this royal dynasty. These royal families have seen from fiefdom to freedom and now the province of Amarkot present Umarkot speaks the stories of Hindu Pakistan. These stories reflect the brotherhood of Indo-Pak partition. Sodha Tahkur alias Rana Chandra Singh the father of Hamir Singh was once a very close friend of Julifqar Ali Bhutto. He was considered being one of the founding members of Pakistan People’s Party (PPP). In 1990 Rana Chandra Sigh was upset with some comments by the leaders of PPP, since then he created a ‘Pakistan Hindu Party’ (PHP). The flag of PHP was saffron coloured and bore the symbols of ‘OM and TRISHUL’. At one time the population of Umarkot was 80 per cent Hindus which still stands at 50 per cent. For 53 years Rana Chandra Singh was elected as a member of Pakistan National Assembly. He was also a minister in PPP government and was the chairperson of the minorities’ commission of Pakistan. On 1 st August 2007, Rana Chandra Singh left for his heavenly abode. His dead body was brought to Umarkot where he was cremated with full state honour. His widow Rani Subhadra was a Rajstani princess, daughter of Raja Tej Singh. Immediately after the cremation Kunwar Hamir Singh was ceremoniously anointed as the 26 th Rana of Umarkot. He still enjoys a very privileged position among the Thakurs’ families an honour which was accorded to the royal families before independence. On the eve of Indo-Pak partition the rulers of this region chose to stay in Pakistan as it was 400 Kilo Miters away from Indian borders. Situated in the Sindh province spread over 48.6 sq. Kilo Miters this region now has a population of 12 thousand though influence of Rana Hamir Singh spread over 22 sq. Kilo Miters but many Hindu families have either left for Rajastan or moved abroad for business purposes now. gallows inside the royal fort of Amarkot. private coffers. In case of function in any family the Rana attains it in his royal car with his cavalcade. His son prince Karni Singh is an advocate in the zonal court, but he still retains the royal splendor. He is married to a girl from a royal family of Jaipur, Rajstan. The family now admits that by not joining the state of India at the time of partition was a great mistake although in terms of financial prosperity Rana Amar Singh is still very strong but he forced to compromise in many situations. Karachi. They have their own family temple, family priest and the day begins of ceremonial worship. If any Hindu family in Pakistan faces any trouble they rush to Rana’s family for assistance. Rana uses his influence and helps the person in need. Amarkot is connected by road with Karachi and some other cities of Pakistan. The goddess Kali and God Shiv temple along with Manhar temple of Kathwar are completely safe and protected. Inspit of it being a small area there are hundred schools and twenty collages situated in that area. These institutions provide education to all nearby villages. The love stories of Umar-Marvi are still song and praised in the folk tradition of the region of Umarkot.